Malaysia …Truly Asia!!! Well…you all must be aware of this advertisements broadcasting since a long time. Yup…guys it’s all true as this wonderland is the sum up of Asia, showcasing its culture and traditions through its architecture and cuisines. The fragrance of its traditionalism is immersed in the air of the country. So why not make a plan for a Malaysia Tour Packages or Malaysia Holiday Packages as this pave you a great option to explore this country drenched with culture and its colors and spending some of the memorable moments with your loved ones. Also if you are planning for a new relation, then it’s a great idea to go for Malaysia Honeymoon Packages, and give some of the most beautiful moments to your sweetheart and give a great start to your newly formed relation. Guys with our thoughtfulness at Journeyfix, we organize customized tour for our customers bearing in mind about their budgets, providing Decent Stay of 6 Night & 07 Days in Truly Malaysia of Asian Country. So come and avail the best deals in the market. After Breakfast please be ready in Hotel Lobby for Guided Tour of Island. Late Afternoon Come back to Hotel OR you can Leave Transport somewhere in between. After Breakfast please check-out from Hotel & keep your luggage in Lobby and can enjoy Beautiful Natural & scenic Beauty of This Hill Station. Now we will Move to Airport to take Our Next Flight. Malaysia- Federation of 13 States & 03 Territories. It is one of the Paradise tourist destinations in the region of South-East Asia, offering excellent sun-drenched beaches, enchanting Island, landscape & etc. It is land of Fascinating sights & attractions. Malaysia is also land of many culture, wonder & attraction. 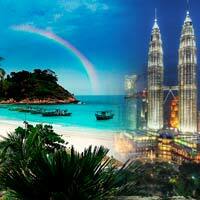 Experiencing Asia is never completed without Malaysia because it is perfect for a memorable holiday destination. Kuala Lumpur:- Capital & Focal Point of Country which is Called & Known as KL City also, it is one of Malaysia’s most iconic Travel Destinations & home to an amazing array of sights, activities and events it is also most popular & preferable tourist destination chugged by the honeymoon copulas around the world. Best Time to Visit:- Every season offers best time to visit this exciting city so people can plan holidays as per their own convenience. Kuala Lumpur weather is usually warm but becomes pleasant as and when it rains. Genting:- Mountain of Colors with Rich & Natural Scenic Beauty, Amusement Park, World famous Casino & Shopping Arcade having Hill Resort and Friendly Tourist Destination. Highland is only place where you can gamble legally in Malaysia. Best Time to Visit:- Tourist Can plan their holidays between March to September. Penang: - Popular & Smart Beach Island of Malaysia, which an another Landmark, Paradise & Tourist Destination for holidays with Historical Attractions, numerous choice of entertainment, Visitor can also enjoy lovely sand beaches & a range of water sports and activities. Main Attraction:- Georgetown city, Penang Hill, Kek lok si Temple, Penang war Museum, Fort Cornwallis, Tropical spice garden, Dharmikarama Burmese Temple, Penang Bridge, Floating Mosque, Palau Aman Island, Jerejak Island. Best Time to Visit: - To visit Penang December, January, February, and March are usually the best Month. Langkawi:- The beautiful tropical Island & has become one of the most popular site in the Malaysian region. Sailing, Scuba diving and other water sports are very good so Beach lovers around the world have discovered the incredible beauty of nature here in Malaysia. Main Attraction:- Langkawi sky Bridge, Langkawi wildlife park, Island Horses, Underwater world, Tengah Beach, Telaga Tujuh waterfall, Cenang Beach, Al-Hana mosque, Rice Garden museum, Crocodile Park. Best Time to Visit: - It is year Round destination and best time to visit this lovely Paradise Island from November to March.